A bill to compel California cities to allow more construction of higher-density housing near transit hubs and job centers cleared its first legislative hurdle on Tuesday. Senate Bill 50 would override local zoning rules and give developers the green light to build four- or five-story apartment buildings near bus, rail and ferry stops in an attempt to spur housing construction. The bill's higher-density rules would also apply in "jobs-rich" areas, a designation yet to be fully defined in the legislation. 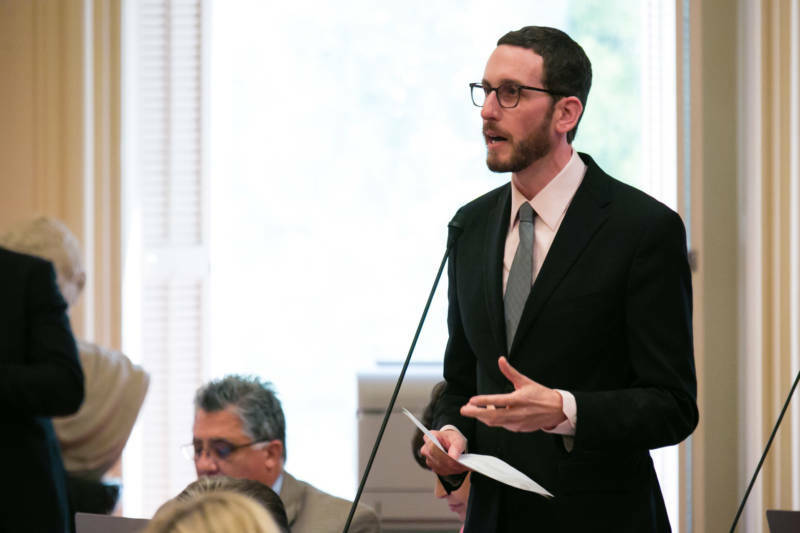 "We have to move past the paralysis on housing and change how we do things," said state Sen. Scott Wiener, D-San Francisco, the bill's author, moments before it passed the Senate Housing Committee by a vote of 9-1. For legislation as controversial as SB 50, this first step was significant: Last year, a similar bill, SB 827, also authored by Wiener, was voted down in its initial hearing. SB 50 would also ease local rules requiring developers to provide parking for each unit, in an effort to remove yet another barrier to construction. Wiener described his legislation, a response to California's severe housing shortage, as "changing the way we've done zoning in California for 170 years." Last year, that challenge to the historical precedent rallied a broad group of opponents, led by homeowners and city council members opposed to giving up local control, as well as low-income residents who argued that building up would spike land values and lead to gentrification. This time around, the legislation requires that affordable housing be included in larger developments. It also exempts areas at risk of gentrification (like East San Jose, East Oakland and San Francisco's Bayview-Hunters Point neighborhood) from the bill's requirements for five years, and allows those communities to design their own plans to boost density. Many of the groups representing low-income residents did not oppose the current bill, instead taking no position and signing letters to the committee "expressing concern." Sen. Maria Elena Durazo, D-Los Angeles, said that "gentrification is very, very high on the list of concerns" in her district. "Let’s change this proposed legislation enough so that other concerns are brought in," she added. But opponents of greater state involvement in local zoning rules were untempered in their opposition. "This is about destroying suburban, one-home-per-lot single-family residential neighborhoods," said Karen Klinger, a Sacramento real estate broker. Other opponents argued that cities are already required to receive state approval for the housing they zone for. "It’s almost as if we’re setting our cities up to fail," said Jason Rhine, a legislative director with the League of California Cities. "You tell us to plan, you approve our plan, and now the rules are going to be changed without additional input." The lone lawmaker on the committee to vote against the bill, Sen. Pat Bates, R-Laguna Niguel, cited her opposition to the provision that will allow developers to include less parking. "Parking in our suburban communities drives so many safety issues," she said. But it was hard to ignore the political progress the legislation has made over the last year. Most obvious on Tuesday was Wiener's possession of the gavel: He is now the chairman of the committee, and that all but assured his bill would advance. The bill also picked up a key endorsement from the State Building & Construction Trades Council, a labor union representing construction workers. And many of the environmental and equity groups that helped sink the legislation last year were missing from the list of opposed organizations this time around. SB 50 now heads to the Senate Governance and Finance Committee, chaired by Sen. Mike McGuire, D-Healdsburg, who has traditionally been a supporter of local control in housing decisions. McGuire introduced his own bill to boost density around transit — SB 4 — which the housing committee also approved. The bill's application would be more limited than that of SB 50, applying only to areas around train and ferry stops in cities where the pace of home construction has fallen markedly behind the growth of new jobs. McGuire said he hoped to finish negotiations with Wiener over their two bills before April 24, when the governance and finance committee takes up the issue.